The rumors are true – Highland Woodworking has a CNC in-house, and we are taking orders for more! We have joined with EZCNC, a company that is based in Dallas, Texas. They are known for building their machines using only American-made industrial-grade components, so these will not be lightweight CNC machines that need a lot of maintenance. 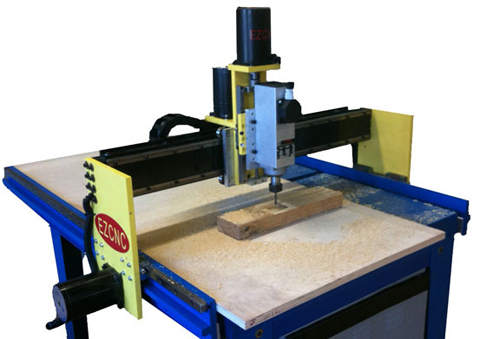 EZCNC was founded on the idea that most CNC systems on the market today are too difficult or technical to be a practical tool in the small to medium shop, and has created a system that is as easy to use as your home computer printer. The powerful software is easily mastered. There are only 10 commands that you need to learn to make most any cut. Highland’s 24×36 CNC machine features industrial quality bearings and motors and is designed for years of low maintenance service. You may equip the machine with your own router to power the cuts, or add the optional 1 HP brushless spindle motor that runs much quieter than a regular router, and allows unlimited variable speed between 100 RPM and 18,000 RPM. Because of its brushless design, its delivered torque is equal to that of a regular 3 HP router. This machine is also capable of controlling tools other than a router. It can be optionally equipped with anything from a plasma cutter to a sharpie marker, and even a pin nailer can be actuated on its z-axis. To find out more, check out the EZCNC on our website, or if you are in Atlanta, come by our store and check it out in person!